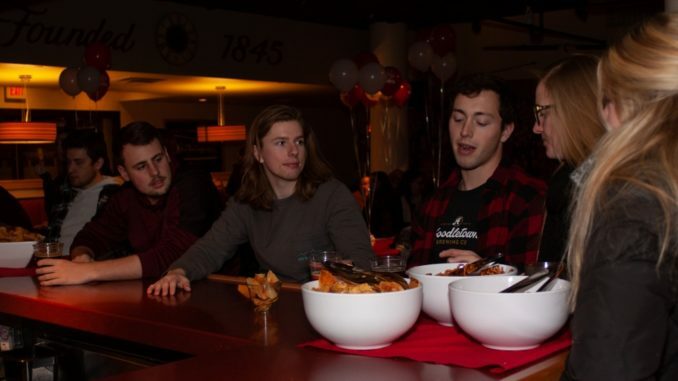 The seniors in Wittenberg’s Class of 2019 gathered this past Thursday in Founders Pub to celebrate 100 Days til Graduation with a free drink, on behalf of Wittenberg. The event was planned by senior class president Chloe Bradburn. Founders was packed with seniors from beginning to end, each encouraged to come reminisce with the rest of their senior class. Many of the seniors in attendance shared hesitations about the coming 100 days but seemed excited about their post-graduate plans. Likewise, Megan Harber shared that she’s nervous about the coming 100 days but is thankful for all of the friends that Wittenberg brought her. Abigail Crum reflected on her time at Wittenberg with a few close friends during the event. Both Crum and Mong shared their post-graduate plans. No matter what any of the seniors talked about during the night, the smiles on everyone’s faces told the greatest story, as Founders was filled with laughs until the very end of the night. The class of 2019 also had the opportunity to vote for honorary class members, although the members were not announced at the event. After the event at Founders concluded, the senior class made its way to Station One to continue celebrating and looking toward their remaining 100 days at Wittenberg. Commencement will take place on Saturday, May 11 at 11 a.m. in Commencement Hollow.